Should I apply now, or wait? The main recruitment fairs have been and gone (just the Postgrad Study Fair on 20th November and the Law Fair on 19th November still to go), the employer campus events are starting to thin out, and the whole “Get your career together NOW!” frenzy is calming down a bit. What if you haven’t done anything yet? 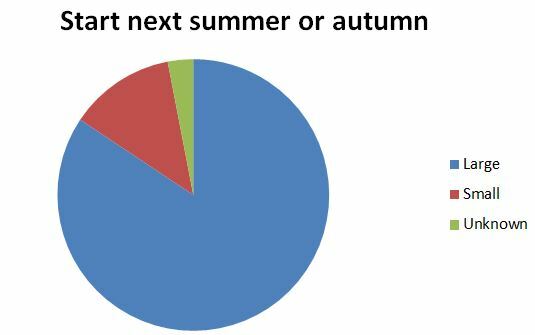 Should you still try and apply for jobs right now, to have something lined up for next autumn? 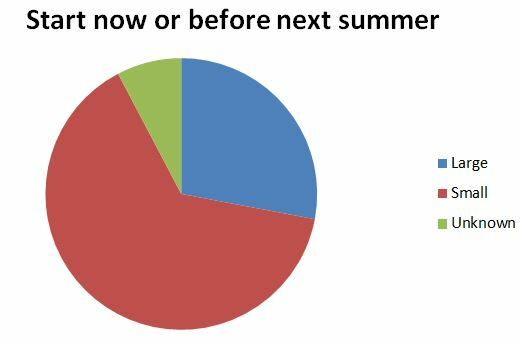 Should you just wait and start to look next summer, because all the good jobs will surely have gone by now? Well, I wondered that too, so I had a look at what we’re currently advertising on CareersLink to find out. 454 ads were for jobs starting now, or soon. This also includes all the jobs where recruitment is “ongoing”. So, lots of jobs are still being advertised for next autumn start dates. If you want to get ahead, there is still time to apply for these “graduate schemes”. But what if you want to wait? Well, there’s one more bit of info you need – who’s recruiting when? This shows the size of the organisations who are recruiting right now for jobs starting next summer/autumn. and there are a few where it’s not clear (as these organisations aren’t big household or industrial names, they’re more likely to be small than large). As you can see, a large majority of these “start next year” jobs are for large organisations, including a lot of the ones you’ve heard of. Few small organisations are going to recruit so far in advance. This the picture for ads for an immediate start date, or for jobs which start before next summer. There are still some large well-known recruiters advertising for immediate start jobs, including some, like Shell, who advertise their recruitment as being “ongoing”, all year round. However, most jobs are working for small organisations (the majority of these are organisations with fewer than 50 people). Many of these jobs with smaller organisations are fantastic, working with specialist or niche employers, where you’ll get to see more of what goes on in the whole organisation. You’re also less likely to be in some sort of “training scheme” – you’ll be doing a job from day 1. Do I want to work for a large well-known employer, possibly on a graduate scheme? If so, you’ve a far better chance if you apply now. Am I aiming at starting with a smaller employer, in a specific job? If so, you can probably afford to wait until closer to when you want to start work – but don’t miss out on the 50 or so smaller recruiters who are also advertising a year in advance.